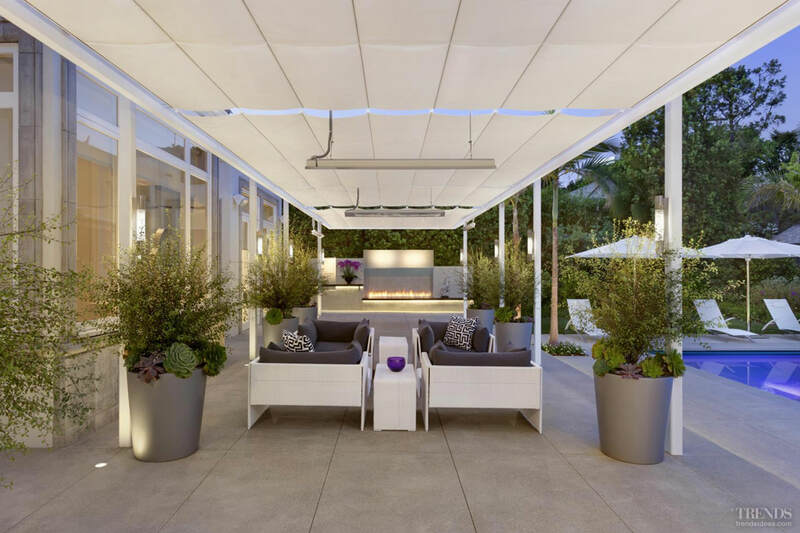 Our compliments to Katherine Spitz Associates, Inc., Landscape Architect, and the contractor, Sable Construction, of Los Angeles, CA for their outstanding attention to detail and to the coordination of this project in Beverly Hills. 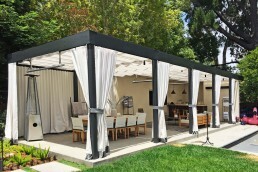 ShadeFX was contacted during the design development phase of the project and worked closely with Katherine Spitz Associates insuring that the steel trellis design would be fully compatible and integrated with the nine ShadeFX motorized retractable canopies for this project. 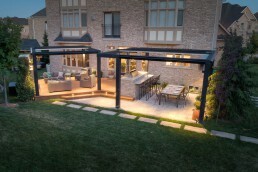 The design objectives focused on the symmetry of retractable canopies with the trellis bays, the design of canopies to fit with the proposed radiant heaters attached to the trellis and to achieve the perception of one continuous fabric cover floating above the space with a translucent appearance. Because visual lightness of the frame was paramount, ShadeFX applied an aircraft cable system to stabilize the canopy wing tips as the canopies extend and retract. Like all stabilizers used with ShadeFX retractable canopies, these cables also keep the canopies steady during the occasional Santa Anna wind gusts. In the end, the owners of this house reinvented their expansive backyard with a design that accommodates 10 or 60 guests comfortably with a modern visual appeal. A perfect setting for hosting large charity and social events. This project was featured in Trends Home & Architecture Magazine. Read more. This project was featured in Trends Home & Architecture Magazine.